Preheat oven to 400 degrees WITH pan in it, on the lower rack of the oven. While oven and pan are preheating combine all ingredients- a blender works best to ensure they're combined with a maximum amount of air in the batter. Remove pan from oven and, while still hot, grease cups and fill to roughly 3/4 full with batter. When finished, remove from oven, let cool slightly, then puncture with a small knife letting the steam escape. This will keep them from getting too soggy due to excess steam. 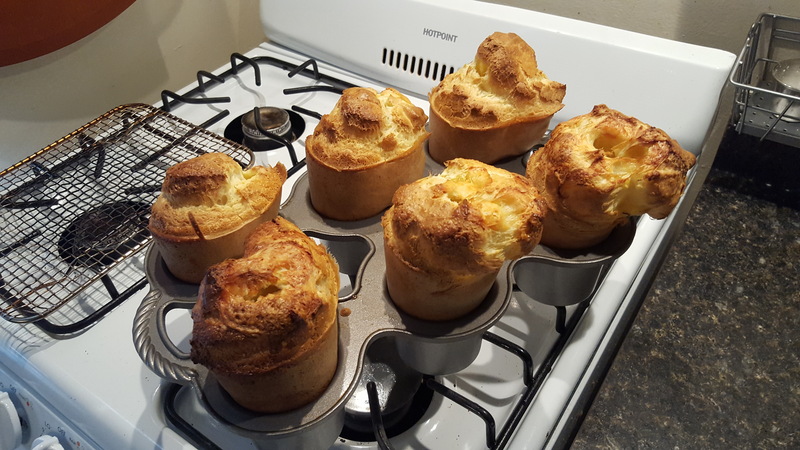 Popovers can also be 'spruced up' a bit by using a compound butter, or adding a cube of cheese after the batter has been poured into the hot cup. I recommend multiple small diced cubes of cheese, 3mm or so cubed. 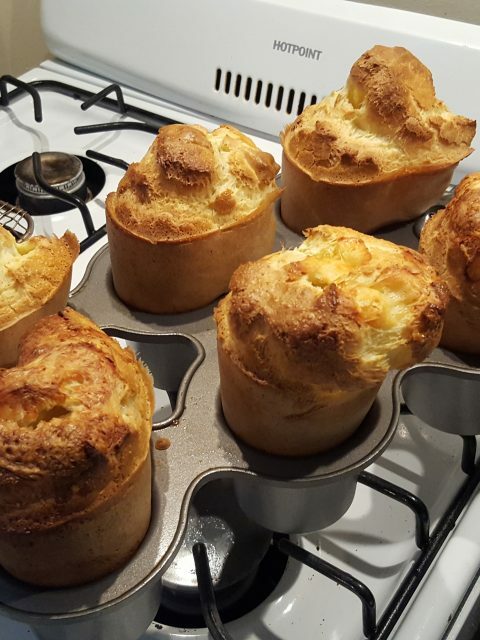 Larger cubes tend to sink to the bottom of the batter and just end up in the base instead of throughout the popover. While I have no actual 'proof' if this is helpful, observational evidence points to room temperature batter giving superior results. Another 'trick' I've read is to start at 450* for 20 minutes then reduce heat (again, without opening the oven) to 350* for the last 10 to 15 minutes. I like the way I wrote it in the recipe.